“As well as international/national action, we also need to put strategic economic localisation at the heart of national economic policy, making local food, community-owned energy, genuine local democracy, a culture of entrepreneurship and local investment for local benefit the foundation of a low-carbon, resilient economy. And it should be thrilling”. “The question here is “what should we do differently?” The answer is “pretty much just about everything”. Nationally and internationally, while the scale and pace of climate change are accelerating, meaningful responses are dwindling. Part of our collective paralysis comes from the fact that we struggle to imagine a world with less energy, less consumerism, less annual GDP growth. What will it look like, sound like, feel like? Does it inevitably mean that you should start seeking out your cave on Dartmoor as we speak, and developing a taste for slugs? Of course not. 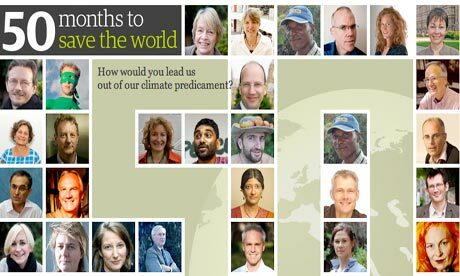 Shortly before the 100 Months campaign began, I was part of initiating an experiment to see what a self-organised response to climate change might look like, one based on rebuilding community, on the belief that what is needed is people, everywhere, making their communities happier, healthier, lower-carbon, and more resilient, in a huge variety of ways. Streets’ programme has enabled almost 700 local householders to reduce their carbon emissions while rediscovering a sense of community on their streets. Bristol soon sees the launch of the ‘Bristol Pound’, the UK’s first citywide Transition complementary currency. Transition Brixton’s ‘Brixton Energy’ is installing community-owned renewable supported by local people. Check out www.transitionnetwork.org to get a sense of the amazing flowering of inspired projects underway. as a potential new business, new livelihood, new apprenticeship opportunity. is where our successful navigation of the next 50 months lies”. It is well worth having a look at the blog and going through the various answers the other 49 contributors have posted to those questions. Human population of 1 billion by 2150, richest/ poorest person income ratio of less than 10 by 2150 and less than 1000 by 2042, one planet global ecological footprint by 2084, 10% annual reduction in CO2 emissions in overdeveloped countries until 2036, replace VAT by pollution added tax by 2023.